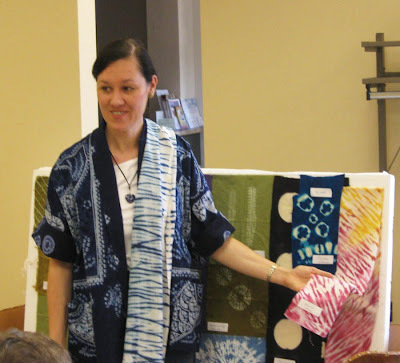 My multimedia presentation called, "Shibori. 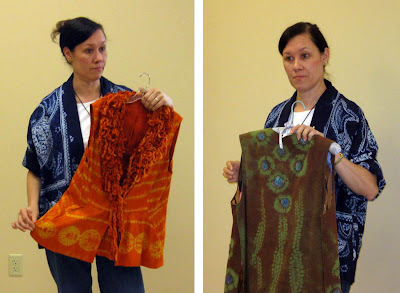 Making marks with shaped resist dyeing." was a big hit at the Riverbend Fiber Arts Guild meeting this morning. The audience was very attentive and attendees were mesmerized by the patterns and possibilities. There were many inquisitive and thoughtful questions during the Q&A session and trunk show. What a great audience! Thanks for a great reception to my iPad multimedia presentation. One of my favorite shibori patterns, arashi, which means "storm." I brought along several shibori pieces from my wearable art collection including vests and jackets in silk noil, silk dupioni and wool. And, my two pieces that were featured in Belle Armoire, "The Power of Panthera Leo" and my mokume jacket were available for up-close inspection. Left: "The Power of Panthera Leo"
Right: A shibori dyed raw silk vest with appliqués of Angelina fibers. I put together a display board of various shibori patterns. Fabric examples include silk dupioni, raw silk, cotton and wool. I also had larger pieces that were passed around so the audience could see the dimensionality created through the shaping and dyeing processes. 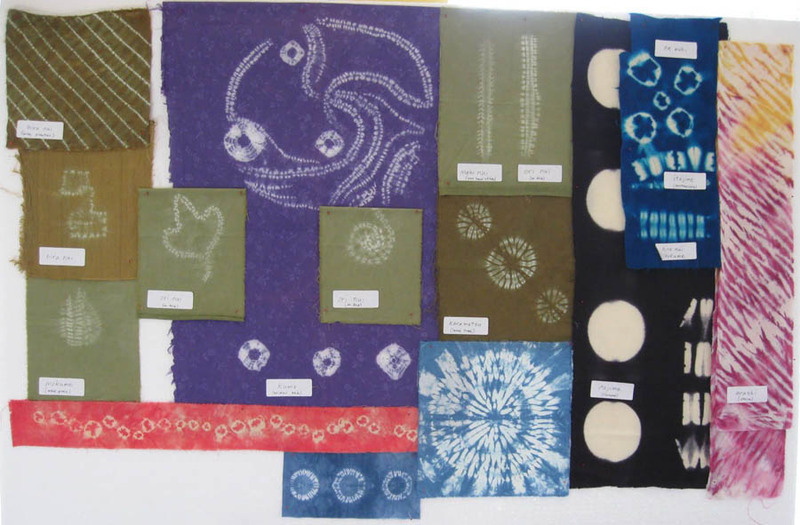 My display of Shibori examples. I'm available to do this presentation and trunk show for guilds and groups. Contact me via e-mail at veronicaquilts@gmail.com if you are interested! For those who want to learn more about shibori, here are some of my favorite references. Also visit the World Shibori Network.